Brockville was short a waterfront bell after theirs was taken in December, and now a town a little further down the rail line has offered a replacement. After an old train bell was taken from Brockville's waterfront this past December, a town a little further down the rail line has offered a replacement. 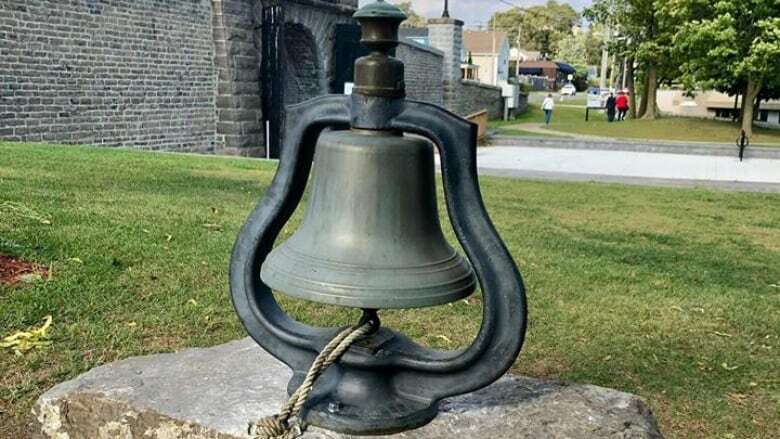 The stolen 155 to 135 kilogram brass bell was donated to the City of Brockville by a collector, who said it was from a train that used to run between Brockville and Ottawa around the turn of the 20th century. It was installed in a garden near Brockville's railway tunnel in September, but then vanished sometime between Dec. 24 and 28, according to Brockville police, who are still looking for the culprit. On Tuesday, the Town of Smiths Falls and its railway museum announced they're sending over a replacement. "This gesture helps to turn a frustrating act of petty theft to an opportunity to be reminded how the railroad can both literally and socially connect our communities," said Brockville Mayor Jason Baker in a news release. The Railway Museum of Eastern Ontario in Smiths Falls said its bell came from a train built in Kingston and taken out of service in 1952. The bell was then taken to a cottage, and then wound up in a Hamilton, Ont., private school before ending up in the museum's collection. "The railway history of our communities has been interconnected without pause since the mid-1850s and I am certain this engine bell made many trips into Brockville," said museum president Tony Humphrey in the news release.